We had a wonderful interview with Dan Pink on Friday, October 1, 2010. He had been on the road speaking without a break since September 15th, both in the UK and US. home from a speaking engagement in Saint Michael’s, Maryland. He was superb…. Daniel H. Pink is the author of four provocative books about the changing world of work, including the New York Times bestsellers, A Whole New Mind and Drive: The Surprising Truth About What Motivates Us, which together have been translated into 28 languages. 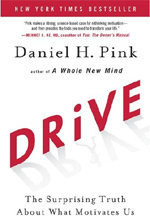 Drive: The Surprising Truth About What Motivates Us uses 50 years of behavioral science to overturn the conventional wisdom about human motivation and offer a more effective path to high performance. Drive reached every national bestseller list in its first month of publication and is now in its sixth month on the New York Times list. Over the next year, it will appear in Japanese, Korean, French, German, Spanish, and 19 other languages. His articles on business and technology appear in many publications, including the New York Times, Harvard Business Review, Fast Company, and Wired, where he is a contributing editor. He also writes a monthly business column for the U.K. newspaper, The Sunday Telegraph. Dan has provided analysis of business trends on CNN, CNBC, ABC, NPR, and other networks in the U.S. and abroad. And he lectures to corporations, associations, and universities around the world on economic transformation and the new workplace. A free agent himself, Dan held his last real job in the White House, where he served from 1995 to 1997 as chief speechwriter to Vice President Al Gore. He also worked as an aide to U.S. Labor Secretary Robert Reich and in other positions in politics and government. “These lessons are worth repeating, and if more companies feel emboldened to follow Mr. Pink’s advice, then so much the better. Daniel Pink’s home page at Learn From My Life. Compilation of various digital assets describing Dan Pink’s work, books, media news links etc.